Ignore anyone who tells you that you need to spend three month’s salary on an engagement ring. That’s just ludicrous. We’re here to show you how to get the best deal on an engagement ring, so you have plenty left over for the honeymoon. Don’t let a jeweler overwhelm you with all that talk about cut, color, clarity, and carat. If you’re trying to buy the best ring your budget will allow, make your first priority the cut of the diamond. That’s where most of a ring’s sparkle comes from. Diamonds with a “very good” cut rating offer the best value for bargain seekers. They reflect almost as much light as an “ideal cut,” but cost significantly less. Jewelers love to pop diamonds under the microscope to show you their flaws. But how important are those flaws, if you can’t see them with the naked eye? Save yourself a bundle of money, and buy a diamond that’s “eye-clean.” That’s the industry term for a diamond that looks flawless to the eye. On the clarity grading scale, that’s a diamond with a VS1 grade or higher. People tend to shop for half-carat rings or full-carat rings. They don’t usually walk into a jewelry store and ask for a .95-carat ring or a .47-carat ring, and that’s something you can work to your advantage. Buy a diamond that’s a speck smaller than the norm, and you can expect to save at least 15-20 percent. That’s a pretty big savings for such a tiny difference in size. Ask a jeweler to show you a one-carat ring and a .95-carat ring, and you won’t even be able to tell the difference between the two. Fake the look of a big diamond by choosing a halo setting. That’s a setting where a bunch of smaller accent stones surrounds the center stone. It can make the center diamond look as much as half a carat bigger. Use this trick to make a half-carat diamond look like a one-carat diamond, and you could save $2,400 or more. Don’t get so wrapped up in the cost of the diamond, that you overlook the cost of the setting. All of that platinum or gold adds up, too. To keep the metal weight down, opt for a simple prong setting. It’s a timeless look that happens to be an affordable look. Want a show-stopping ring without the heart-stopping price? Go with a vintage ring. Most independent jewelry stores buy and sell estate jewelry, so you don’t have to look far to find heirloom-quality engagement rings with spectacular settings and cuts that you can’t get nowadays. And the best part? Since jewelers are usually able to acquire estate pieces for less than new pieces, you can expect to pay quite a bit less for your ring. Want to save even more? Then, include antique stores and pawn shops in your ring search. Just be sure to do your homework first, so you go in understanding how much you should expect to pay for the particular size and quality of stone that you’re interested in. You want to be the person who comes out with a killer deal, not the person who gets suckered into paying too much. Bring your own jeweler's loupe, so you come across as an experienced shopper (you can pick one up for around $10-15), and ask as many questions as you need to to be comfortable with the purchase. The shop may or may not have the papers to go with the ring, but should be willing to accept a return, if you find they’ve misrepresented anything. Get them to write a detailed description of the ring on the sales receipt, including the carat, the type of metal used in the setting, the quality of the stone and whether or not the diamond you’re buying is, in fact, a natural, untreated diamond. Make sure they know you intend to have the ring appraised, and will expect a full refund if the appraisal doesn’t match what you’ve been told. Then, follow through with that appraisal. The shop may try to recommend a gemologist-appraiser to you, but if you want an unbiased assessment, it’s better to choose your appraiser and to refrain from telling him or her where you bought the ring. Of course, none of this matters, if your spouse-to-be isn’t on board with a second-hand ring. Some people consider it bad luck to get married with a used ring, if your partner shares this view, don’t push the issue, or try to sneak a used ring by them. That’s no way to start a marriage. Wish you could afford to design your ring? Shop around for a second-hand ring with a beautiful stone in an ugly setting (or a pendant necklace with a knock out diamond). Then, have a jeweler remove the diamond, and place it in a new setting for you. This will allow you to save on the diamond, so you can afford to spend on designing the perfect ring for it. You can also use this trick to update a family ring with a dated setting. Just make sure your family is good with the idea before you dismantle an heirloom. Online jewelers have less overhead, so they can afford to charge less. Spend some time visiting local jewelry stores to hone in on what you’re looking for. Then, take your search online. Reputable companies, like Blue Nile and James Allen, offer a pressure-free sales environment and a money-back guarantee. For the biggest savings, steer clear of any website attached to a big brick-and-mortar brand. Their online prices probably won’t be any better than their in-store prices. Want the very best deal on an engagement ring? Then, you may want to avoid proposing at Christmas and Valentine’s Day. Since these are popular times to pop the question, the selection is likely to be picked over, making it less likely that you’ll find a bargain. Steer clear of that November through February shopping time frame, if you’re serious about finding a deal. The summer months are your best bet. Since it’s typically a slow sales time, you’ll find the prices are much more negotiable. Diamonds didn’t become the engagement stone of choice until around 1947. Before that, sapphires, emeralds, and rubies were the norms. Bring back the tradition by selecting one of these eye-catching gems as the centerpiece for your ring. They’re all hard gemstones, so they’ll stand up well to daily wear, and since they cost far less than a diamond, you’ll be able to afford a much larger stone. Hesitant to break with the current tradition? Then, select another colorless gemstone for your ring. Did you know there are white emeralds? While you may not live close enough to New York City to buy a wholesale diamond from the diamond district, you probably don’t live far from a wholesale store, like Sam’s Club, Costco or BJs If that’s the case, be sure to include them in your ring search. While there may not be anything particularly romantic about shopping for an engagement ring at a warehouse store, you may find that the price more than makes up for the lack of ambiance, especially if you get a percentage of your purchase back on your yearly rebate check. Whether you decide to buy your ring online or in store, it needs to come with a certificate from the Gemological Institute of America. It’s the only way to ensure that the quality you were promised is the quality that you received. Don't take a risk on such a large purchase. "I Hate My Engagement Ring. Now What?" Do You Really Need to Buy a Diamond Over 1 Carat? 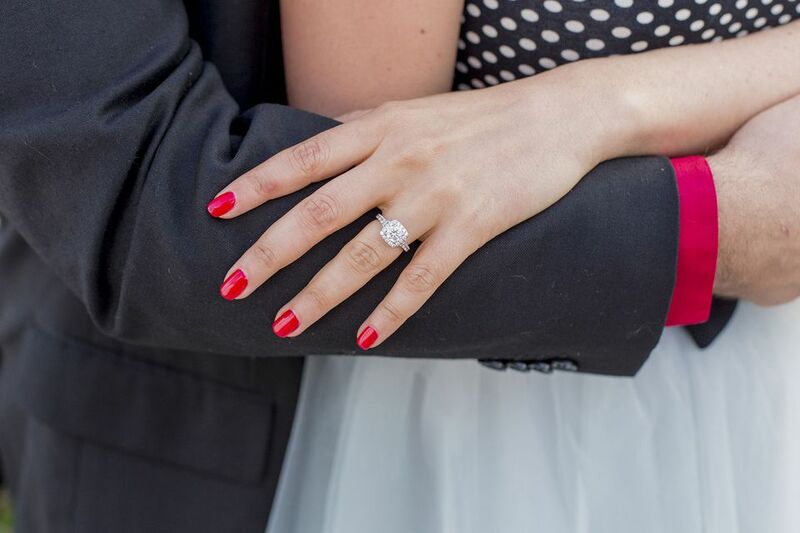 Should You Reset Your Diamond Ring? Is an Antique Engagement Ring Right for Your Fiancée?